The Vancouver Condo Buzz » Final 24 Rowhomes & 12 Storefronts Available at MOSAIC’s OSPREY Pitt Meadows Community > Coming Fall! « From Mid-$200’s > The Anchor North Vancouver Condos in Lower Lonsdale – Only 61 Boutique North Shore View Apartments for Sale! > Georgian Architecture – Stepped rooflines define individual homes in this community some with charming window boxes and distinct portico entries that are both unique as they are beautiful. > Work Where You Live – With the 12 storefronts available at the Osprey Village Pitt Meadows development along with the signature OSPREY rowhomes, you can enjoy working in the same neighbourhood in which you call home. 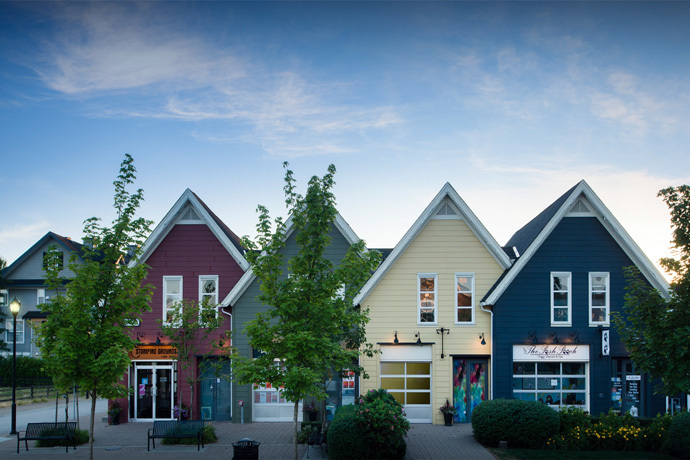 Sidewalk storefronts at Osprey Village with big windows and big street appeal are perfect for neighbourhood entrepreneurs. > Village on the Water – your local coffee house/café, yoga studio, community centre, doggy daycare and more on the shores of the Fraser River right here at the Pitt Meadows Osprey Village community. > Exacting Standards – MOSAIC Homes invests in the best designs, details and construction – creating principled proportions and using noticeably better materials and techniques. Enjoy long term value here at OSPREY Pitt Meadows. Raised portico style entryways will greet you and your guests and the beautiful 6’8” front door with a transom window above will provide plenty of illumination. The outdoor spaces include a covered garden patio as well as an eight foot deep main level deck. The ground level will have 9 foot ceiling heights and the master and second bathrooms will also have over height ceilings as per floor plan. 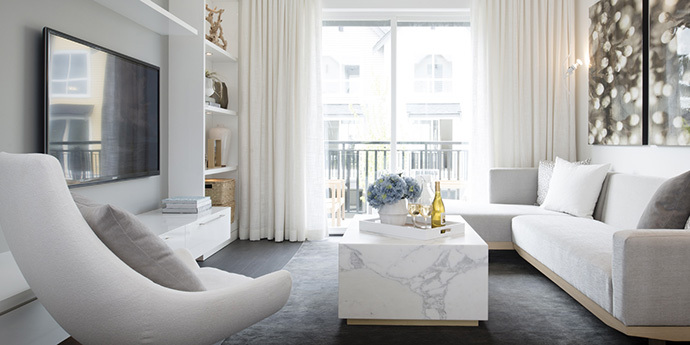 The Pitt Meadows Osprey homes will also have laminate floors on the ground level, matte porcelain tiled flooring in the store rooms, laundry and bathrooms and bedrooms will have cut-pile carpeting with premium underlay. The new rowhomes will also have track lighting and pot lighting throughout in addition to art niches as per plan. The master bedrooms are oversized and will easily fit king sized bed. There is a dresser alcove and his/hers closets as well. The presale Pitt Meadows Osprey homes will also have contemporary, flat panel cabinets in the bathrooms along with soft close doors and modern hardware. They also have matte porcelain tiled flooring, high efficiency Sterling toilets, Grohe shower heads, ceramic tiled bathtub and shower surrounds as well as wall hung or pedestal sinks on the ground level bathrooms. The rowhomes also feature square porcelain sink in the master ensuite along with full width mirror with featured millwork ledge. MOSAIC designed wide profile laminate counters are included or there is an optional upgrade for slim profile polished quartz counters in the bathrooms. 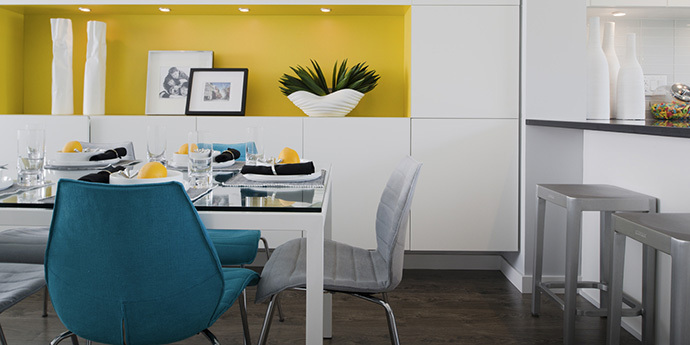 The beautiful kitchens at the presale Pitt Meadows Osprey Rowhomes will feature roomy peninsula with sliding glass deck doors and contemporary flat panel cabinets. The stainless steel Whirlpool appliance set includes a self cleaning oven anr range, Energy Star five cycle dishwasher, over the range microwave with integrated hood fan and large Energy Star refrigerator with French Doors, PUR water filtration system and water/ice dispenser. Optional upgrades are available for appliances. Laminate counters are included or you can choose quartz at an upgrade price. Under cabinet halogen task lights, cabinet finish open shelving and contemporary flat panel cabinetry with soft close doors are all standards at the Osprey Pitt Meadows rowhomes. This Autumn, the final 24 rowhomes and 12 storefronts in MOSAIC’s OSPREY Village will be available for purchase. Village Charm, Stone’s Throw Convenience. > Osprey Pitt Meadows is on the Fraser River shoreline with a seawalk to remember. > Local coffeehouse, yoga studio, community centre, doggy daycare, and more. 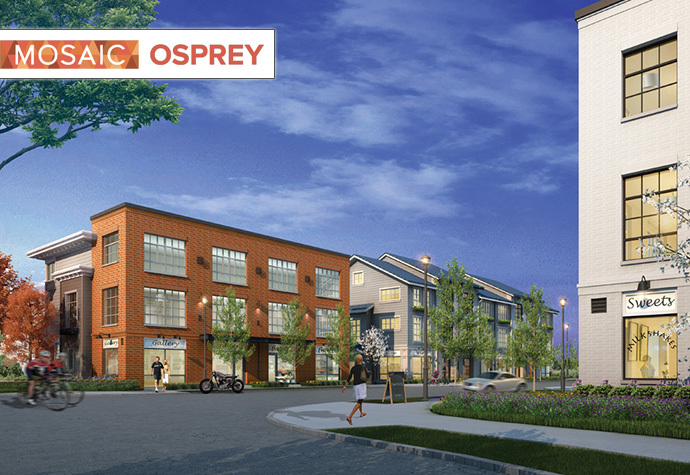 > Osprey Pitt Meadows is a quick drive to the 650,000 sf of retail underway at Fremont Village. > Handily close to both the West Coast Express and Golden Ears Bridge. > Elementary and secondary schools within an 8-minute drive. > The Osprey Rowhomes – 2 bedroom and 2 bedroom + den layouts, some with views, all with MOSAIC’s design-driven details. Bright kitchens, roomy bedrooms and bonus storage rooms on the ground level. > The Osprey Village Storefronts – 500 square feet retail workspaces*, perfect for artists, accountants, physiotherapists, and neighbourhood entrepreneurs. *Square footage is approximate. This is not an offering for sale which cannot be made without a disclosure statement. E.&O.E.